Pinterest is a gateway (drug) for inspiration. Note that. So one night I'm with my insomnia and scrolling through yet another pinning wormhole and I come across this wonderful shot of a woman wearing a tank top that read: Abuse of power comes at no surprise. 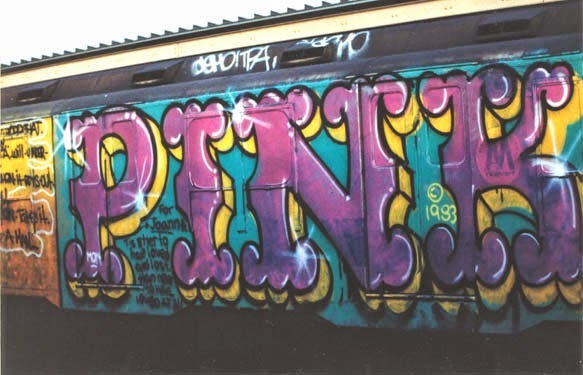 The photo, the woman, the saying, all of it fascinated me to investigate where it all came from and after a quick stroke of the keys I became aware of the bad assery that is the godmother of graffiti art, Lady Pink. 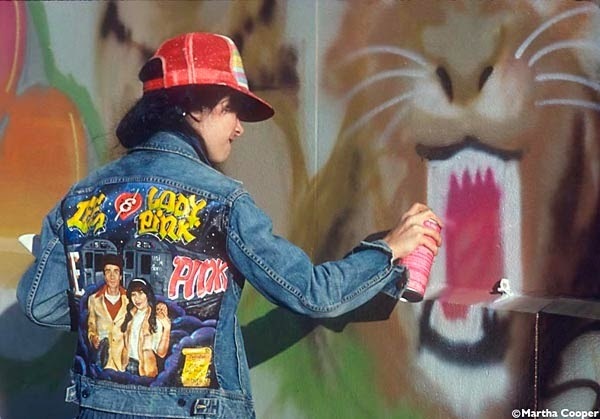 Born in Ecuador, and raised in Queens, Lady Pink began writing graffiti in the late '70s after being introduced to it when she was a student at High School Art & Design in Manhattan. 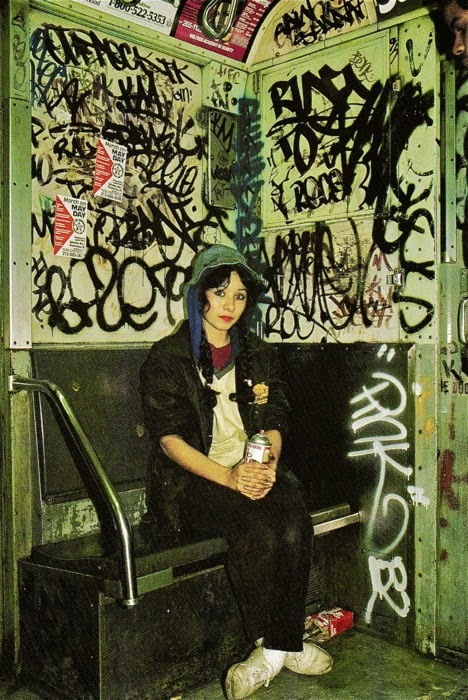 From 1979 to 1985 her canvases became the rolling subways of New York City. 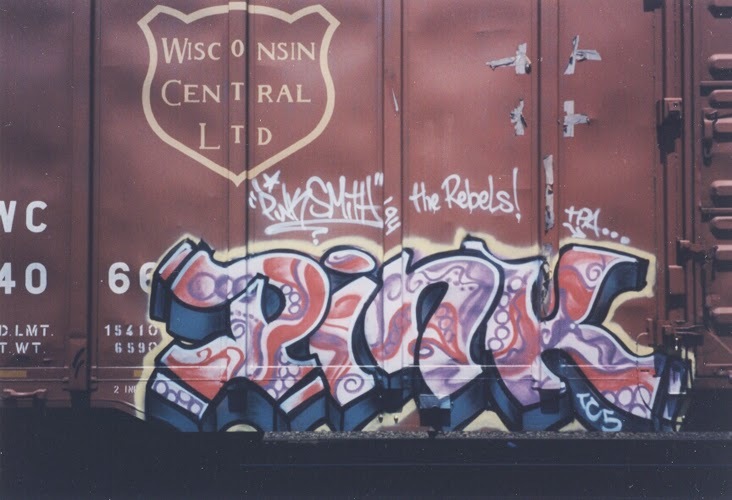 Her vibrant and socially provocative style led her to become one of the most prolific artists in the hip-hop subculture, and her running with noted tag crews like TPA (The Public Animals) and TC5 (The Cool 5) and being the only woman in their midst led to her standing out strong. Today, Lady Pink continues to pound the concrete and create eye-catching murals, but she has also become active in teaching, and conducts workshops and lectures at numerous northeast college campuses. As the times have changed and feminism has caught up with society, a lot of females are into street art and graffiti because they’re just being made stronger, tougher, sturdier, and they’re not all feminine and dainty and delicate and need to be protected by some man. Girls are braver and they are just as foolish and reckless as the next guy and they’re out their showing their thing. 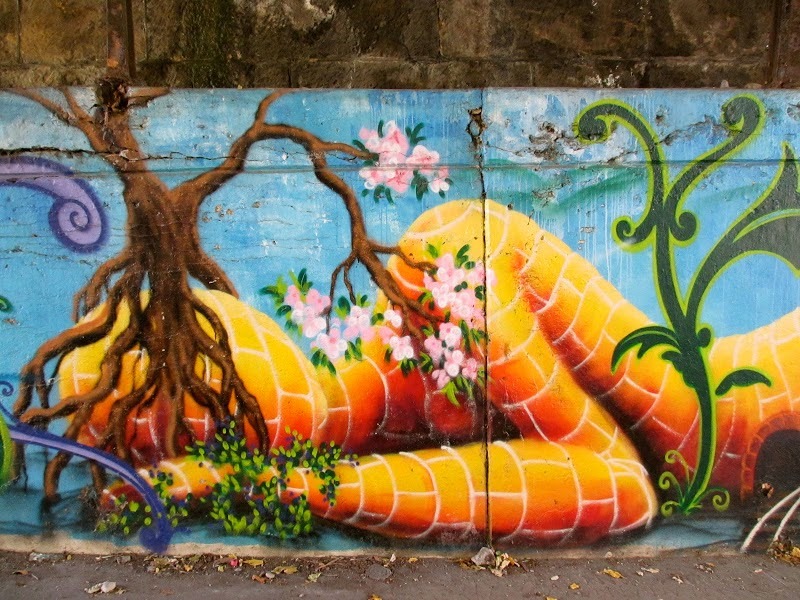 And I think it’s a cross-section of our society- you see women in sports, women in the military, women invading every aspect of our world and the same thing with graffiti- they can paint large, they can express themselves just as boldly as any guy and there’s nothing holding them back. I’d like to think I set an example earlier on that no matter what size you are or gender or anything, it just takes a lot of dedication and a lot of courage and a lot of heart to get this done, and a lot of women have followed suit. I’m certainly not the very first one. I’m not really much of an activist so I don’t see why people put me in that sort of a role. I just do what I do and go about my business, being a strong female so folks seem to think that I’m a role model in that way. I like to speak on women’s issues because they are relevant to me and in my life. The sexism that I've encountered, it’s not like I’m trying to be a feminist per se but I’m just speaking out about the injustices going around that women and children and minorities endure. And since we are (still) on the subject of feminism...remember the tank top that Lady Pink sports in the first photo? The story behind that points at NYC conceptual artist, Jenny Holzer, who earned notoriety in the 1980s for her post-modern feminist "truisms". She designed the shirt, and Lady Pink sported it about NYC while Holzer took snapshots. Talk about feminism in motion! Since I come from the South where graffiti is pretty much a frowned-upon felony, New York street art and its lifestyle has always fascinated me. My paltry knowledge of the hissing can life is just from seeing it in films like 1982's Wild Style (which Lady Pink starred in) and Rembrandt from one of my favorite films, 1979's The Warriors. Completely square dance, right? Well, I've always wondered how artists like Lady Pink can get away with tagging, especially if there are some grouchy folks out there who don't see the bold strokes and vivid colors as art. 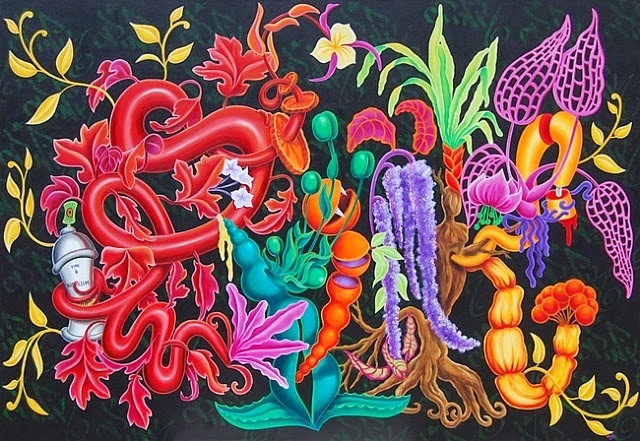 In the interview, Lady Pink does give insight on how street artists do in fact struggle to express themselves on non-traditional canvasses even today, as well as the numerous legal troubles that occur when practicing this type of expression. The interview is a lengthy read, but an wonderfully inspiring rebel yell as Lady Pink's non-conformity and her journey to elbow her way into the 'boys only club' to strip gender applicators are why she's an inspiration to us all on how the expression of self is all about showing up and putting yourself out there no matter what the risk. You can view more of Lady Pink's art at her webspot to soak in more art awesomeness.